It was an honor to attend as Chairman of our organization with our CEO and Founder Margarita Mendoza. It’s been incredible to see the support from our consumer and business members since the event. 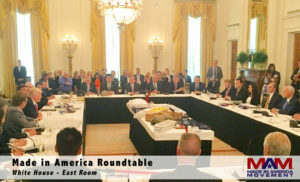 What was the Made in America Roundtable? One of the platform positions Candidate Trump ran on was an increased focus on the American economy and jobs. Shortly after becoming President, he launched the Buy American/Hire American initiative under the White House Office of Trade & Manufacturing Policy. 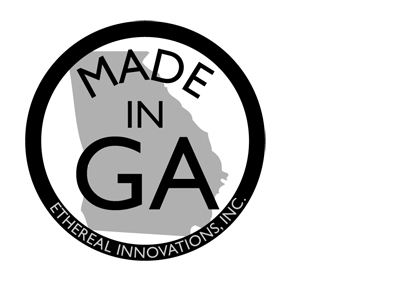 The roundtable ultimately came as a result of the new initiative, being the culmination of the newly announced Made in America Week. The current administration felt that highlighting American Made companies and addressing the issues tackling companies would be better in the summer, away from the holiday buying season, which would also allow for more business-to-business products to be highlighted. That led to Made in America being a focus this July, and the creation of Made in America Week. 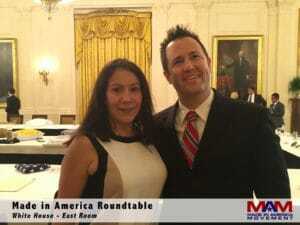 Shortly before the announcement of Made in America Week, the White House reached out to us about the roundtable. MAM is happy to work with any administration, federal or local, that is focused on helping level the playing field for American companies, so when they asked if we could help in the selection of companies at the event and for us to participate, we were happy to help. In the end, MAM helped eight companies and 15 people join the roundtable. It was an incredible opportunity to influence the current administration. 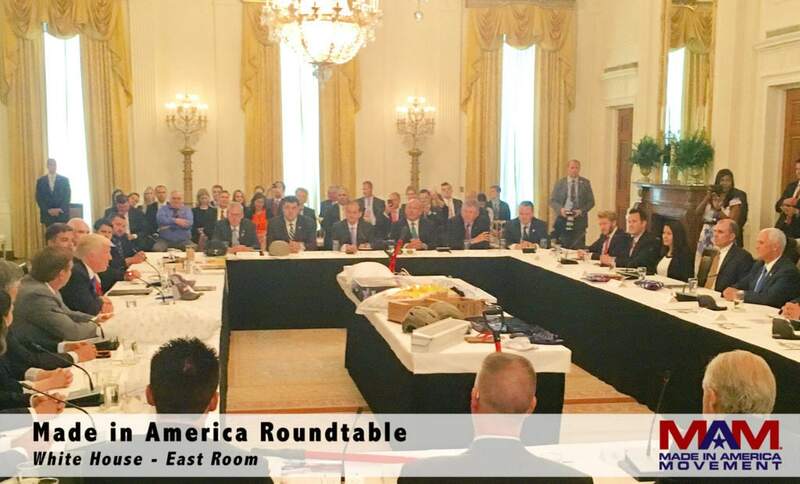 The Made in America Roundtable took place on Wednesday, July 19th, 2017 in the East Room at the White House. 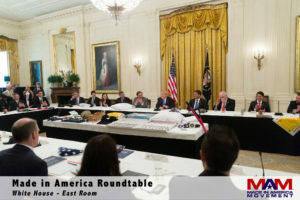 The goal of the roundtable was 1) to hear more about the President’s focus on American companies 2) allow the President and the administration to hear from leading business experts and some of the top companies creating Made in America products. We’ve received many questions in person, on Twitter, on Facebook, and in email about the event. I wanted to take a few minutes and to share with you more about the roundtable. The public portion of the roundtable was about 24 minutes (see CSPAN coverage), followed by private discussions with the group for another 45 minutes following the press leaving. The President started the discussion with what seemed like a “soft” question of whether people preferred Made in America or Made in U.S.A., but there is a lot more behind this question, including consumer perceptions, ability to protect the usage legally and international standards on country of origin claims. It’s actually a deep topic and one that MAM will be covering in much more detail in the next few weeks. We then moved on to discussions of consumers’ perceptions of quality, how some foreign produced goods are misleading consumers about where products are made, and what the government can do to help support American companies. “We’re here today to continue our celebration of American manufacturing as part of Made in America Week. The leaders and innovators around this table create the products that fill our homes, defend our nation, and enrich our lives. And each one of these products proudly carries the label, Made in the USA,” said President Trump. It appears that those at the table are looking at ways the government can assist with help to ensure fair competition between countries and companies. Over the past 10 years alone, we’ve seen multiple instances of other countries unfairly subsidizing certain industries and supporting the “dumping” of goods. It’s great to see the increased focus on ways to enforce the principles of fair trade. One of the topics I supported at the table was to look for ways to help to ensure the integrity of the Made in America and Made in USA labels. We’ve seen a growing number of companies using misleading marketing/labeling to take advantage of consumers’ desire to buy the high quality, and dependability that “Made in the U.S.A.” has come to symbolize. Consumers have standards they believe are included when they see the words American Made but those are not always the case. We need to protect those beliefs and American companies by protecting the integrity of the Made in USA label. Our team at The Made in America works every day with our member companies to highlight them to consumers and to help educate people to look for the “Made in USA” label. This roundtable is just a small part of the proof of our efforts. What Margarita Mendoza started as a personal mission has turned into a movement impacting millions of people. We stand behind American businesses, strengthening our country and reinforcing our position among world leaders. Want to see more pictures from behind the scenes at the White House? Click here for an informal tour of some places in the White House that few people get to see. Do you work with an American Made company? Are you an American manufacturer? Please consider becoming a member so we can highlight you through the year and help tell your story. We also have sponsorship opportunities available for those that want to support MAM’s efforts but are not yet able to use the Made in USA label. Be sure to sign up for our newsletter. Stay tuned for upcoming giveaways, company stories, job opportunities, and more information on how to get involved. Also, please click here to tweet this story and the links below to share on other networks. 5 Things I Wish I Knew When I First Started: Corey Towe Will The Skills Gap Impact Advanced Manufacturing In Small Town USA?